Reissue of 1993's AFX* - Analogue Bubblebath Vol. 3 in slimline jewel case. There are 2 stickers on the case. 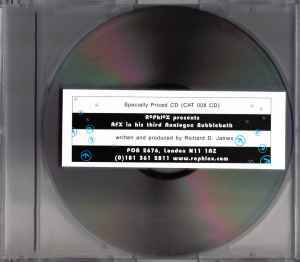 written and produced by Richard D. James"
The sticker features Aphex logos and the postal address of Rephlex. "CAT 008 CD: 13 tracks. ℗© 1997 Rephlex. All rights reserved. Published by Chrysalis Music. Made in England. Distributed by Vital / Charged"
The stickers on the front and back of the case contain the only text on the entire release. The CD is entirely blank. No track titles are listed but this is the tracklisting based on the inlay from the Analogue Bubblebath Volume 3 japanese editions with corrections where applicable. Also note that tracks 1 & 6 differ from the Analogue Bubblebath Vol. 3.1 vinyl versions.The release is identical to AFX In His Third Analogue Bubblebath but was produced by a different manufacturer. In this case, the manufacturer was Key Production whereas the other was manufactured by Technicolor. Track 11 is the ambient background of 'The Garden Of Linmiri' by Caustic Window.